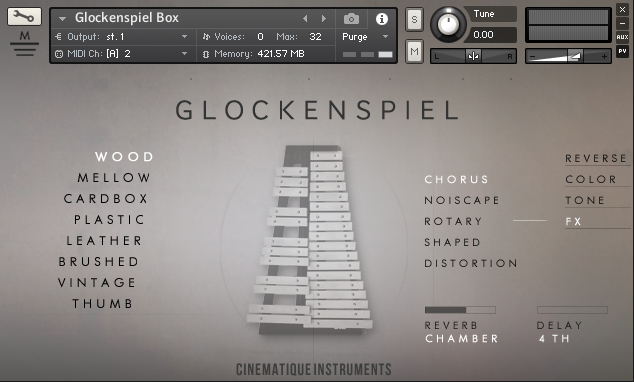 As bonus we added 2 articulations of this tiny variation of a Glockenspiel. It just covers a range from C5 to C8. Our Sopran Glockenspiel was used as a vintage children toy. In music of the 20th century and beyond, the word metallophone is sometimes applied specifically to a single row of metal bars suspended over a resonator box. Metallophones tuned to the diatonic scale are often used in schools. Our metallophone starts on C3 and ends at C6. 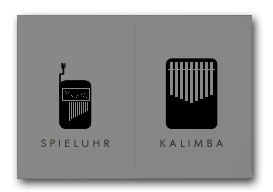 The Spieluhr (as known as musicbox) is a small instrument which produces sounds by the use of a set of pins placed on a rotating cylinder plucking the tuned teeth of a steel comb. Our Spieluhren are tiny with a size of 2,4 x 2 x 1" and cover a range from G4 to G7. This is not a musical instrument. 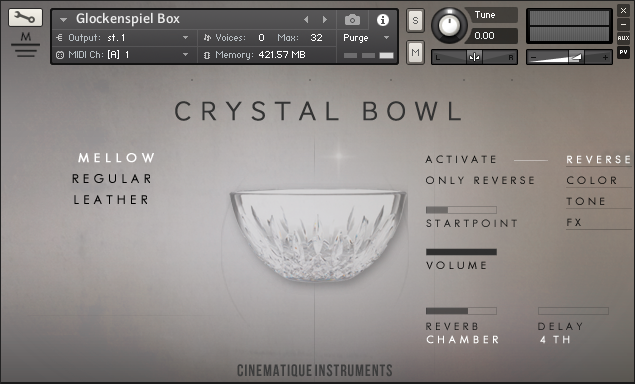 It is a crystal bowl which you will mostly find in a domestic surrounding. We hit the bowl with different kinds of mallets creating low and mellow sounds which will spread from C2 to C6. We have set a major focus to come out with instruments that provide maximum versatility giving you a wide range of tools and options to shape the sound of the instruments. In order to realize that we used lots of different kind of mallet types such as hard typical wooden, soft felt, a piece of cardbox, medium hard plastic, soft leather, a pair of drum brushes and rubber. In the end we come out with a total of 21 different articualtions! Finally we added lots of interesting and inspiring features giving you a wide range of tools to vary and change the sound at your own requirements. You can layer 4 different attack sounds as well as add a corresponding reverse sound to your chosen articulation. Beside that there lots of 'standard' effects such as EQ, distortion, lofi, chorus etc. All the instruments were recorded in maximum quality with Neumann and Schoeps microphones. We have mostly recorded 4 round robins with up to 4 velocity layers. One complex patch including three articulations and advanced scripting. Approx. data 0.7 GB compressed data and over 2.000 Samples. For more details please read the reference manual.